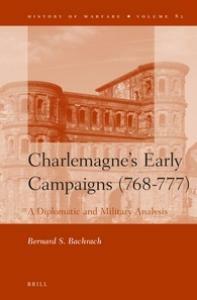 Charlemagne's Early Campaigns is the first book-length study of Charlemagne at war and its focus on the period 768-777 makes clear that the topic, for his forty-six year reign, is immense. The neglect of Charlemagne's campaigns and the diplomacy that undergirded them has truncated our understanding of the creation of the Carolingian empire and the great success enjoyed by its leader, who ranks with Frederick the Great and Napoleon among Europe's best. The critical deployment here of the numerous narrative and documentary sources combined with the systematic use of the immense corpus of archaeological evidence, much of which the result of excavations undertaken since World War II, is applied here, in detail, for the first time in order to broaden our understanding of Charlemagne's military strategy and campaign tactics. Charlemagne and his advisers emerge as very careful planners, with a thorough understanding of Roman military thinking, who were dedicated to the use of overwhelming force in order to win whenever possible without undertaking bloody combat. Charlemagne emerges from this study, to paraphrase a observation attributed to Scipio Africanus, as a military commander and not a warrior.